Latest version: 1.0.2 for 1.7.10. Road Stuff 2 is now under development for Forge 1.13.2, with 1.14 being targeted as Forge 1.13.2 won't have a release build. 1.8 - 1.12.2 is unlikely to have a port as those versions are quite different from 1.7 10- and 1.13+. No ETA yet for the new version so don't ask. Remember the mod is open-source so someone can do a port if they want, or make a custom version for their server. I will not take any responsibility for any problem caused by Road Stuff. ALWAYS MAKE BACKUPS WHEN ADDING/UPDATING A MOD! 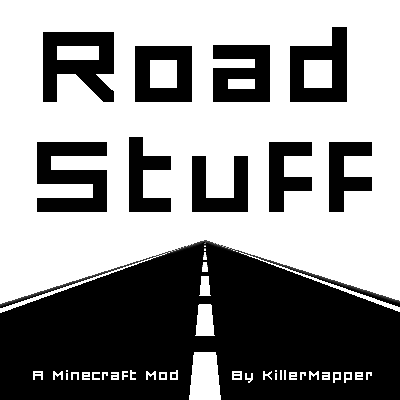 Road Stuff brings blocks and items related to roads in Minecraft. • Road Blocks: Asphalt, Concrete, with plenty of painted lines on it (no boost given while walking on them). • Traffic Signs: With many variants for signs (from many countries from the whole World). Customization possible with a right-click on them. Note that 1.7.10 version won't be updated anymore. Source code and bug tracker are linked to the top of this page. Feel free to check them and report any problem! Can you make it for Pocket Edition 1.6.1, please???? It's the best mod I've ever seen of roads! I think Mr.Crayfish[Youtuber] Use a same kind of mod in 12.2 ?? Best road mod ever, just please make it for 1.12.2 as well? I would like to make the 1.12.2 version but many things changed since 1.7 and I need to re-learn everything. And I don't have free time for now to do this (adding to this, I tried 4 times already to move above the 1.8 version, without any success, because of big changes in the metadata systems. My brain has a problem with that.). Someone can port the 1.7 version as the code is public if they want, but on my side I would do everything from scratch, the code is not optimized at all. This epic mod definitely needs a 1.10.2 version. I think you should contact other mod authors and see if you can get a team going to port it forward. Thanks for the 1.7.10 version though, it's on point. Is this server still running, is the main language English and what mods does it use? I have a question, need Chisel or not? And why one of the pictures a stop sign in Russian? Because this mod is in English and not in Russian. Sorry but I bad speak English please correct me if I write incorrectly. Chisel is not needed, but it's very useful to switch between all the different kinds of blocks. If you don't use Chisel, you can still craft them (check with NEI, it will be easier). About the Russian sign, it's just one of the hundred available signs. You have English, French, Spanish, Portuguese, Japanese signs and more. This mod isn't in English only, it has other translations depending of the language selected in Minecraft settings. Currently I build a modded Roleplay-Server on the minecraft version 1.7.10 . We also want to use your mod, but there is a problem, each person can change the road signs. Now my question is whether there is a possibility to activate this only for admins or persons in the gamemode 1. Hi, sorry but there is nothing for that as I never though about this idea. I stopped working on the 1.7.10 version but the code is open so you can find someone who can code to add this possibility. I don't know how to do that but it should be doable I think. Maybe there is some mod / plugin that can lock specific tile-entity from being interacted by random people. That could be worth a search. Hi Mr Steve scout! I stumbled upon your mod and figured that I should download it. However... when I threw the Jar. file into the mods folder and started up the game, it... crashed. I tried it with other versions of the mod and it it kept crashing. This is NOT my first time downloading a mod, in fact I already had several other mods that did not have any issues. Could you know whats wrong? If you will need to I will give you the crash report text files. Without crash log, impossible to tell what could be the problem.